Happy Black Friday! (or just happy friday if you have all your shopping done LOL) If you celebrated Thanksgiving, I hope it was a restful one and full of lots of laughs and good food. This year was the first year we truly cooked a big meal since Stan and I have been together so it was extra special and fun. Most years Stan has had to work on Thanksgiving and years before we ever got together, I would typically have to work super early on Black Friday so it was never a holiday that I enjoyed as much as I can now. Miles slept right next to me at the table and missed all the excitement, but it was still fun having him there. And thank goodness my mom lives with us because I am hopeless in the kitchen (still hoping to change - maybe 2018?!) so she was able to jump and help with a few of the dishes. Miles, Elmo and I provided moral support the entire day which is just as important. Ha! I wore this outfit the other day while running last minute errands before Thanksgiving and realized that a few of the pieces were included in sales happening now! 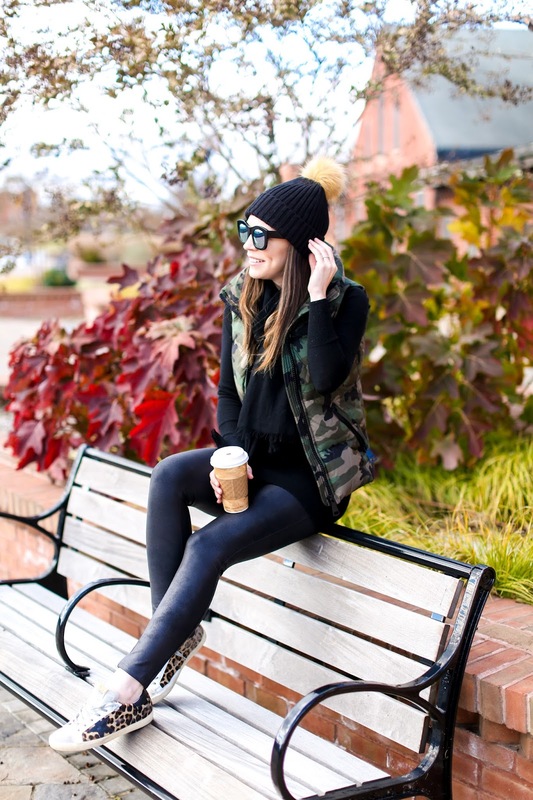 My camo vest is part of the Shopbop sale, as are my faux leather leggings (which I may be a broken record about but they are truly some of THE most flattering leggings I have ever owned). In addition to these two pieces, I went ahead and tried to pick through the sales and highlight some of the items that were my favorites and also seemed like wise choices to take advantage of. There were actually soooo many cute classic ankle boots from all different retailers so I tried to include many of them in the below widgets as well. Whether you are buying for yourself or gifts, I hope you score some great deals today!